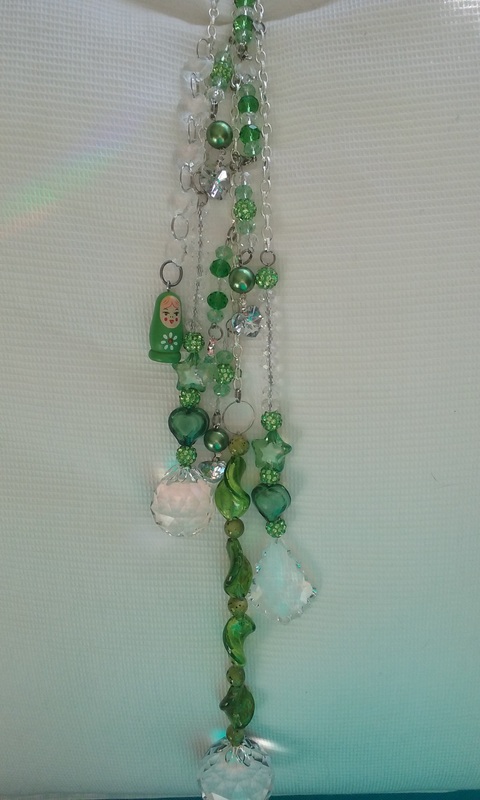 This entry was posted in Creations From My Craft Room and tagged bead work, crystals, giveaway, light catcher tutorial, Orlando the Marmalade Cat, Siddy the Mitzu Dog, suncatcher tutorial by thecontentedcrafter. Bookmark the permalink. Pauline, you did such a brilliant job showing your process! I daresay that if you ever get the capability to video your tutorial (using your phone maybe?) that you could post it on YouTube and you would get a massive amount of hits (and followers)!! Lovely creations filled with your amazing creativity! Pauline, you really are a marvel – these are so pretty! 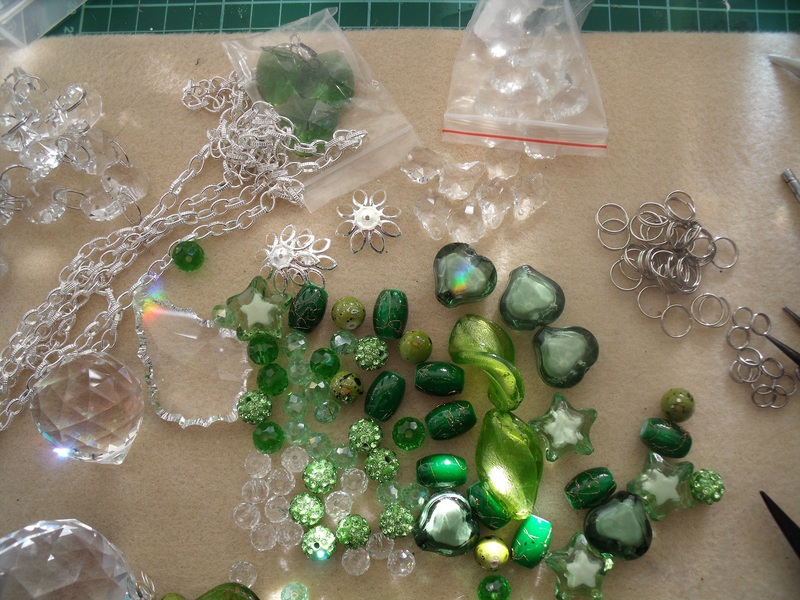 Its fascinating to see your process and I have to say I am really rather envious of your stash of sparkles. You make it look so easy but I fear if I were to attempt to make one there would be more beads on the floor than on the light catcher! 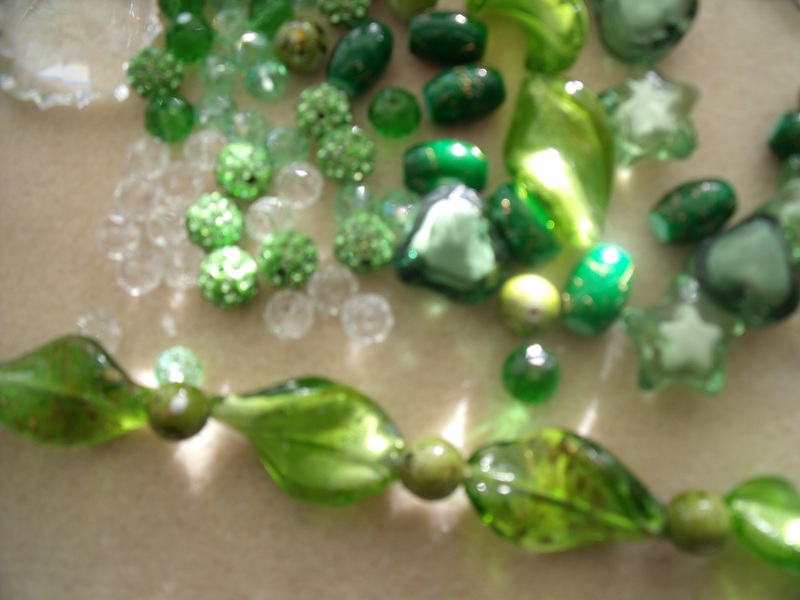 I love your new blog header photo too, it really captures the colours and sparkles of the crystals. You inspire me! My youngest moved out East( last week) and now we truly are empty nesters. Yep, he graduated and got a job and now we finally have no one that needs our help….hmmm….now time to get serious about creating…as always, you inspire me to create! Love these!!!! after I clear out all the years of ” not enough time” to do etc….I am decluttering and putting their “special” items in rubbermaid containers-LOL. NOw we have the space to create + time! I don’t keep their rooms all the same as a shrine-LOL- it becomes space for us! Oh my goodness Pauline! I am so appreciative of this fabulous tutorial. That’s what I get for going out of town for a few days for I might have even missed this all together!!! How could that possibly happened? I was definitely one that was interested in learning all about your beautiful creations and how you do them. Fortunately I sat down this morning to scroll through to see what I might have missed and low and behold there was your lovely light catcher with complete instructions. You did an absolutely marvelous job in explaining everything but I am certain I could never accomplish this. You make it look so easy but I could see my jumble fingers might never achieve such a gorgeous end result even with much practice. 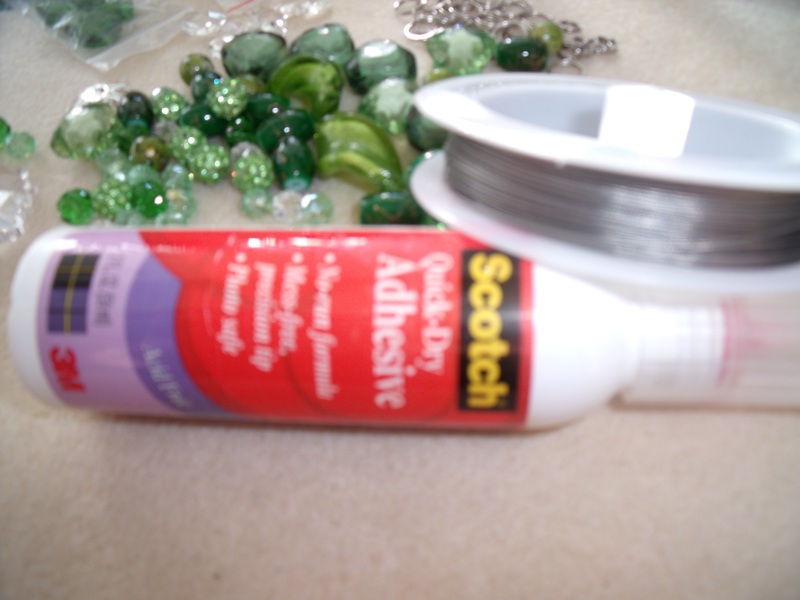 I think my first course of action will be too slowly accumulate some of the items you have mentioned here and collect some beads and other lovely items as I go about my business. iI must have taken quite some time to accumulate a stash of supplies to work with. I know with my fabric stash and buttons and such it took some time. Dare I start another stash of goodies?? I do hope it is a clear recipe for how to get started Jan – I have no way of knowing as I’m so immersed in the processes now. 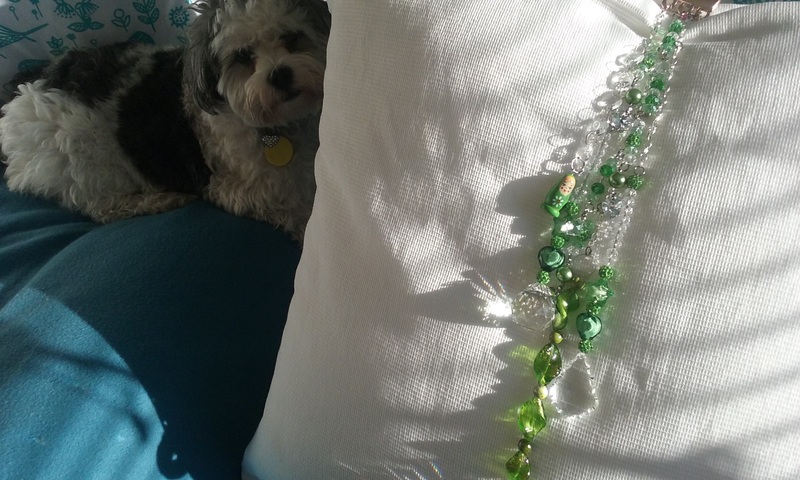 I’ve been hoarding beads for many years – old jewellery and seed beads were what got me started and over the years I’ve added to the collection randomly. 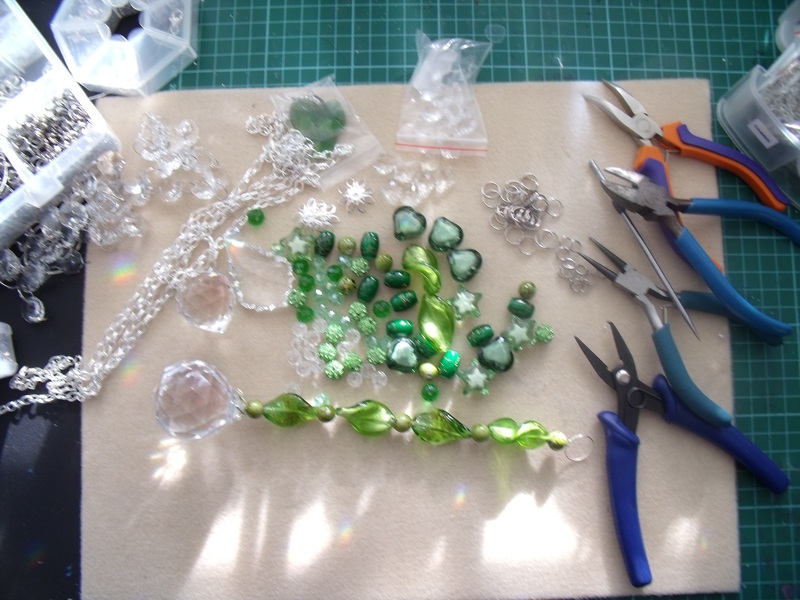 Now whenever I am fortunate enough to sell a piece, the money is used to search out beads of particular shapes and sizes with particular future projects in mind and I use the not inconsiderable stash for fillers and accent pieces. This is such beautiful work, but for all the technique you’ve described here, it takes an eye for colour and design to make something so lovely. Most of us couldn’t produce anything so lovely. I share your love of crystals throwing rainbows across the room when the light is strong. By the way, do you take commissions from across the globe? Green (and possibly orange) commissions specifically? Thank you as always for sharing your wonderful work with us. 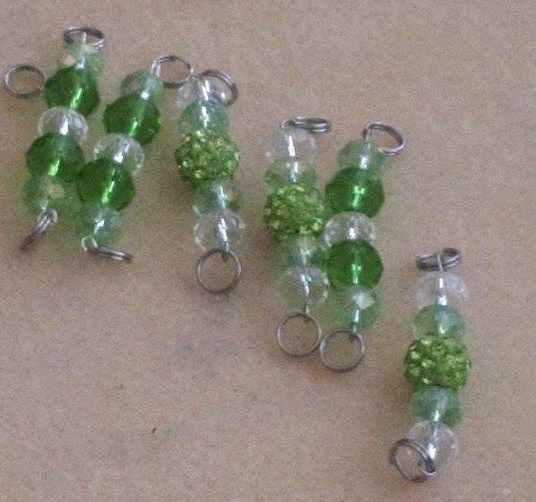 What a pretty collection of green beads and crystals. 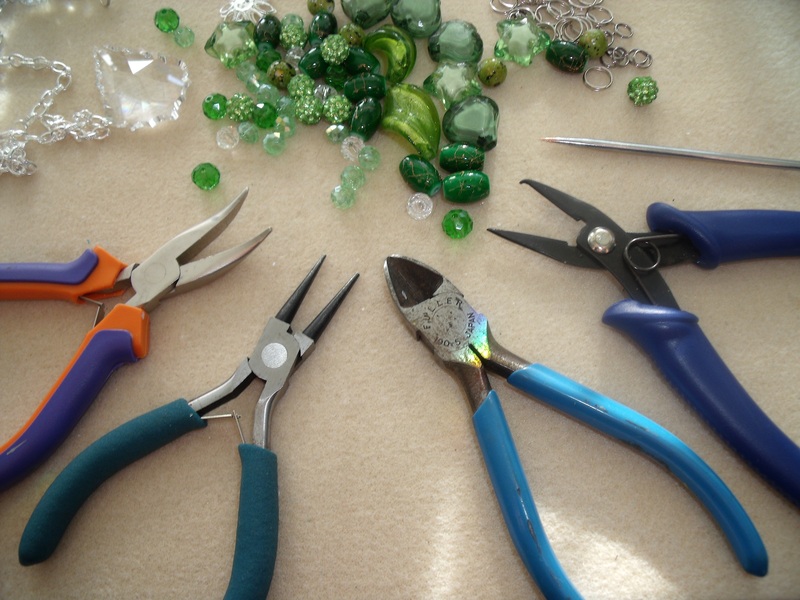 Pauline, I love the way you openly share the tools of your trade and many of the treasures and processes. 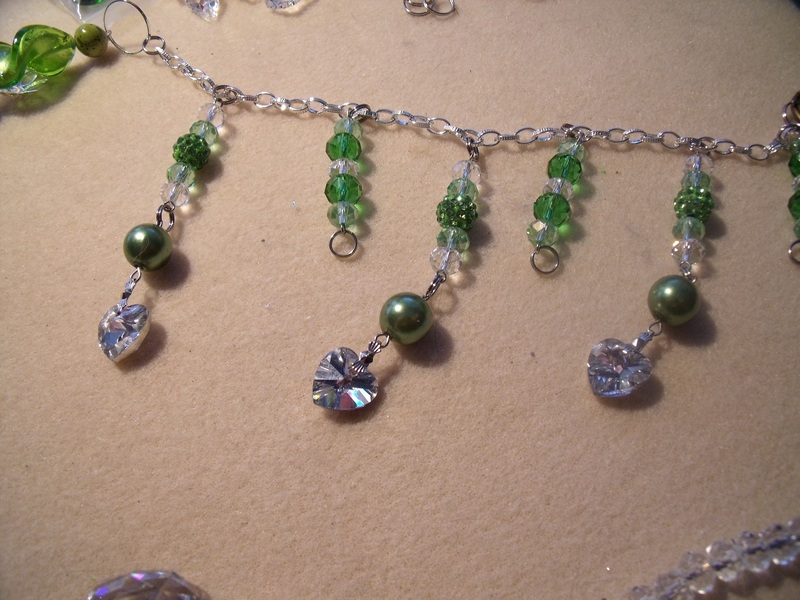 I liked how you did the acrylic beads, pearl ones and glittery jewels. You are a special artist who gives shiny light and reflections of rainbows, too. Now, I liked Siddy peeking around at us, like the little “imp” he is! Orlando is a Prince with stature and poise. Just such a sweet pose he looks wise here on the lacy round (crocheted?) tabletop. Last but not Least, the impressionistic painting behind Orlando is vibrant and lovely, Pauline. ♡♡♡ one for each member of your household. 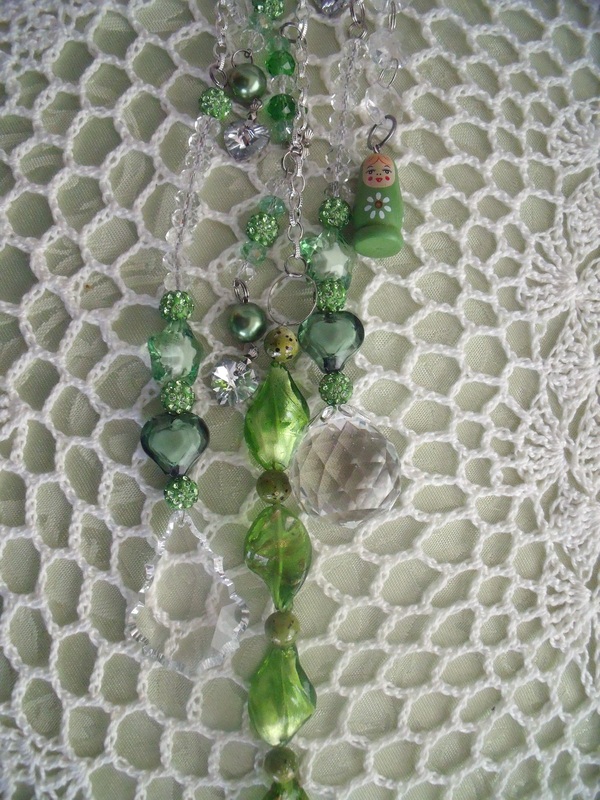 Very pretty, I’ve been making some of these too. Great blog, thanks for the info. Thank you for coming by 🙂 I’m glad you like seeing the process too. Pauline, when you posted pictures of the purple and blue light catchers the other day, I couldn’t decide which I liked best. Now that I see this green one, it’s just one more I love. You are very talented. Thanks for sharing. Hi Pauline, thanks for the detailed explanation of the step-by-step process. Once again you’ve impressed me with your skill and talent. I won’t venture to say that I’ll teying making one:) Have a lovely week, my friend. 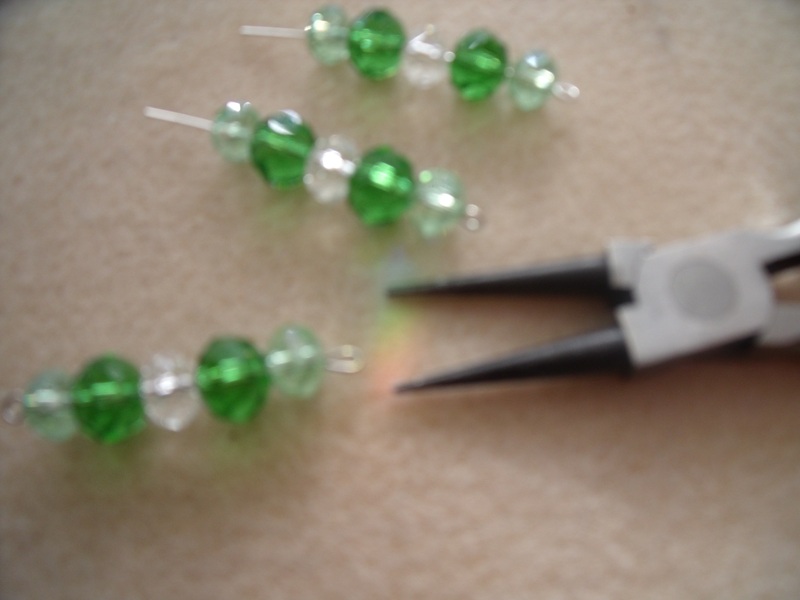 Well, if you ever decide to have a go you can see it is fairly straight forward once you have learned the basics and gathered together the tools and a few pretty beads. I agree – there is a lot of generosity in the world – we don’t hear about it very much is all! What a lovely winter brightener! Catch the light! I shall start using that expression upon leaving somewhere as my farewell greeting! Catch the light! Nice! I hope it will catch on – if it does here is proof of your latest word gift to the world 🙂 Scholars will be searching for it in years to come – you know, the PhD’s etc. 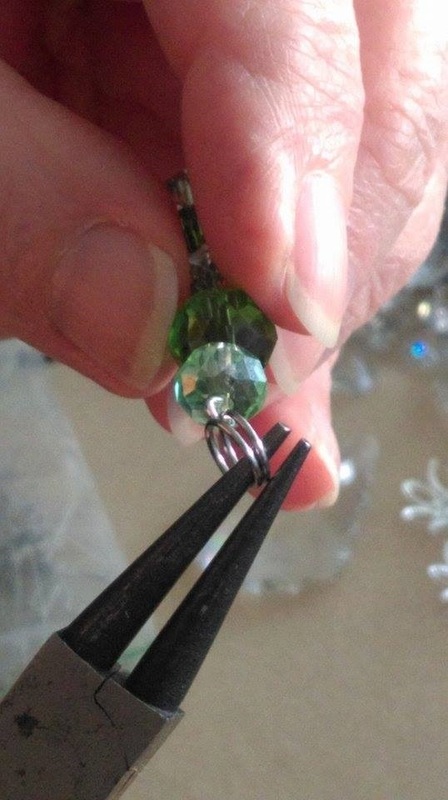 Thank you for taking us through the process and to see the finished article – I really do love your light catchers. The explanations of ‘pokey tool’ and ‘dangly bits’ make it all so easy to understand, and I’m loving that you personalise them for the intended recipient. I’m slightly concerned about Orlando … What is he looking so intently at? When Mama’s back is turned, will there be a leap for the hanging light catcher, I wonder? Glad you enjoyed it Jenny and that the terms weren’t too technical 🙂 I don’t know what Orlando was looking at, I was out when that photo was taken – proving my point that he sits on the table when he thinks he’s home alone – the Official Photographer caught him. So far he hasn’t been tempted by the light catchers, there is one hanging in his kitchen window and he seems to share the space quite amiably. Goodness I love the photo of Orlando. Lots of personality and expression there. I am a huge fan of the felines. Thank you Crystal, so pleased you found it interesting to see the process. They do add to the ‘feng-shui’ of a room and if hung in the right place can bounce hundreds of tiny rainbows around it I have several hanging above my work table and the space becomes quite magical on a sunny afternoon. Impossible to photograph, it has to be seen to be believed. I can’t imagine choosing the perfect combination out of all those goodies, yet you do. Thanks for letting us hang (ooops a pun) around in the work room too. I’m all thumbs with those jumprings and pliers and what not. 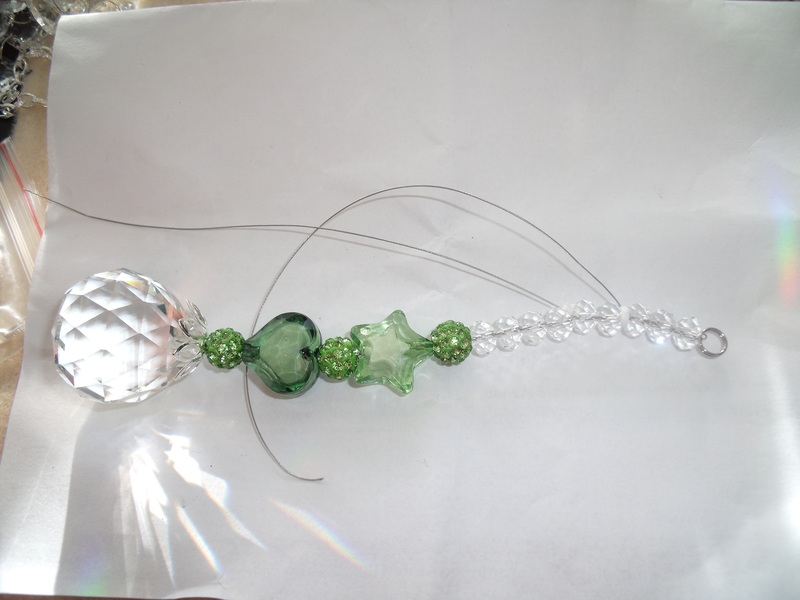 I do make the odd dangly sort of things to add to gifts. 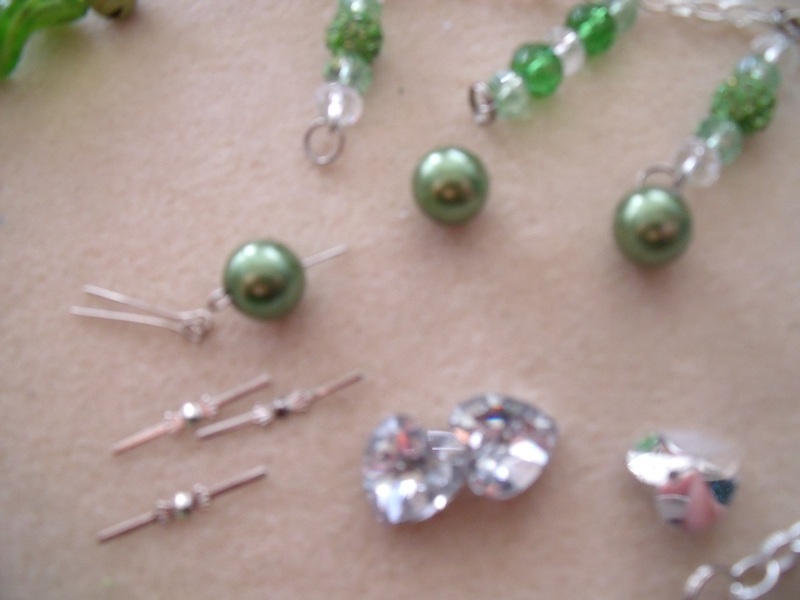 I think it’s outragesly indulgent to add a real pearl or crystal to something for someone special and love that. “Outrageously indulgent.” Yes! Precisely so, and lovely for it. 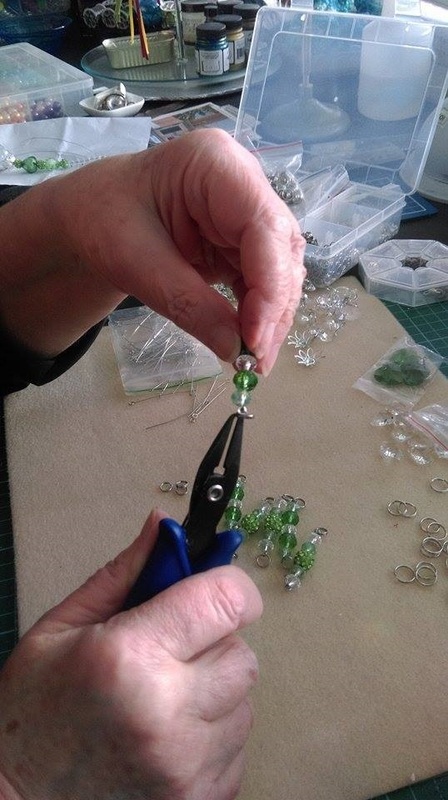 You have a great way to describe the little extras that Pauline lavishes on her sun catchers. It’s lovely isn’t it – I like the thought we can all be ‘outrageously indulgent’!! I’ve looked very carefully at the process you photographed and can only say, that is a stunning light catcher and I could never make one. I will leave that to the expert of design and creativity. Do you sell them on your etsy site? The photo of Orlando speaks volumes. I’d frame that one. Siddy is just sweet. Thanks for taking the time to instruct us in your process. The light catchers are just wonderful. I have closed my Etsy store but will be opening a page on this blog where some of my work will be available. I just have to finish setting up the page. My camera will do that… and if I set it up on a tripod it works fine… I just never get round to doing it, or I remember too late. Very pretty. Thanks for sharing your process. 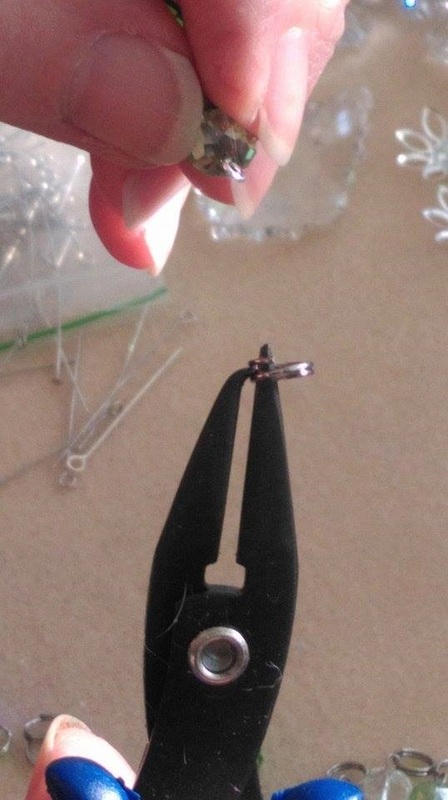 You really did need those split ring pliers!! I didn’t know how these beauties went together and, now that I see the process, I’m even more impressed–just the right balance of structure and freedom in the making. Siddy is adorable but you know I’m a cat person and I LOVE Orlando. He makes me miss my big blond cat so. 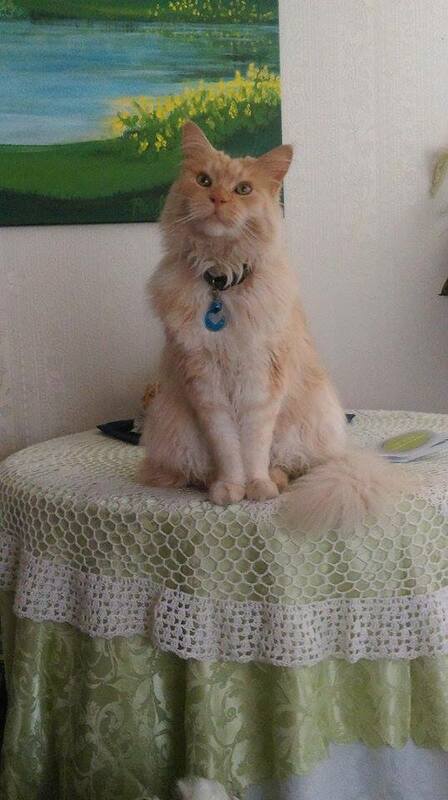 And Orlando is definitely a big, blonde, lovable cat! It crosses my mind from time to time that one day he will be gone too – he is showing signs of age now and has been quiet this winter, sleeping more than ever before. They are with us for such a short time really, it does us well to spoil them while they are here – and to miss them when they are gone! You are right too about the structure and freedom – perhaps that is why I enjoy making them so much. Lovely to see how it’s done. And Orlando looks completely innocent … he couldn’t possibly be in a forbidden place. Thank you – glad you enjoyed it 🙂 It’s not as clever as designing your own clothes, but it is fun to do! Pauline, I really enjoyed hearing about your process. 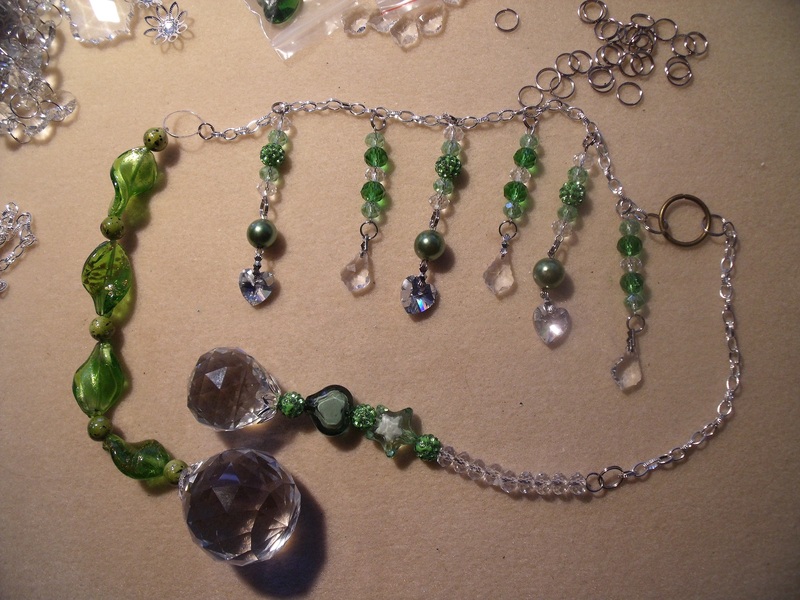 As the proud posessor of one of your charming light catchers, I’m intrigued by the assortment of tools needed to assemble all those beads and glass along with the various pins, wires and rings to help pull the design together. I’m glad you are back to working on something you love. Your eye for color and design shine through. Dear Orlando and Siddy are never far from the action. I’ve just shown Mike your photo of Orlando and he said “handsome kitty!” I agree. Love to you. Orlando is looking particularly handsome in this shot – taken quickly by his Official Photographer as he perched on the forbidden place and tried to look invisible ….. He’s a naughty kitty really! Beautiful work. It looks glorious.